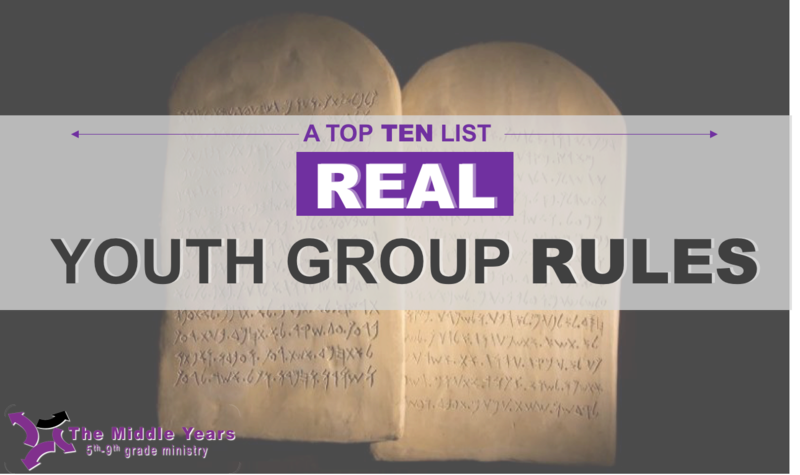 The Middle Years : Top 10: REAL Youth Group Rules!!? Top 10: REAL Youth Group Rules!!? Below are in fact REAL rules that I have had to announce and enforce over 24 years of doing youth ministry. There are, of course, stories and reasons for each, but most of which you can pretty much imagine and figure out! 10. Shirts must remain on at all times during youth group AND adult services. 8. Fireworks may not be lit off inside the building or during youth group. 7. No NEW piercing of any body parts during youth group. 6. No tractor races after youth group. 5. Skunk hunting is no longer allowed on retreats. 4. No playing tag on the roof of the church. 3. All spike collars must be removed before game time. 2. No hitting, kicking, or biting leaders. 1. NO PRANKING THE SR. PASTOR! Great stuff Dan! Funny too!